Q&A: Can Plants Grow in Space? Until recently, microbes were primarily seen as carriers of sickness and disease. However, with technological advances and a few key discoveries that have highlighted their potential for medicine, microbes are now in the research spotlight. Ed Yong explores the nature of the close relationship between bacteria and animals in his new book, I Contain Multitudes: The Microbes Within Us and a Grander View of Life. He not only discusses how bacteria benefit us, he uses bacteria to provide a new perspective for looking at the life within and around us. I Contain Multitudes, a book written by science writer Ed Yong, explores the wonders of microbes and their interactions with humans and beyond. Image courtesy of Ed Yong. Yong begins by discussing of the sheer ubiquity of microbes, thousands of which exist in the air, food, water, and even on this very magazine page. Then, he effectively weaves a narrative that follows how microbes affect our bodies: how we maintain and manipulate our relationship with them, the benefits we reap from this relationship, and what happens when it fails. Throughout the novel, he emphasizes how wondrous the relationship between microbes and animals is for life. His chapter on horizontal gene transfer, the movement of genes from one organism to another without a parental-offspring relationship, was particularly interesting. He included an example of Bacteroides plebeius, a bacterium common throughout the world, and Zobellia galactanivorans, a bacterium found on seaweed. In the Japanese population that more regularly consumes seaweed than the rest of the world, Zobellia transfers its genes responsible for the digestion of seaweed carbohydrates to Bacteroides that resides in the gut microbiome of the Japanese population. Cases like these illustrate the stunning speed at which bacteria are capable of adapting and evolving. Yong also weaves an interesting narrative about the Wolbachia bacterium into the book. “Wolbachia so fascinating because of how widespread it is, and how it plays important roles in human disease” says Yong. It is heralded as one of the most successful microbes on the planet because of its presence in 40% of insect and arthropod species. It originally did not have a practical medical application when it was first discovered, but has recently been found to be able to potentially treat treat tropical diseases like the Dengue fever. “The whole story is a testament to science that does not have to have an immediate and practical application,” said Yong. 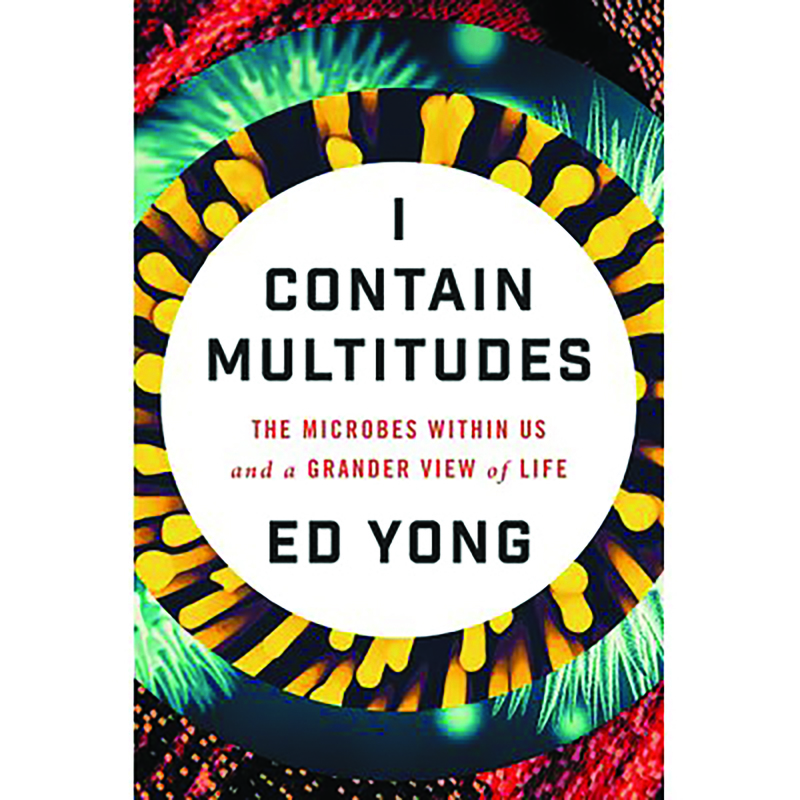 In I Contain Multitudes, Yong nods to past, notable discoveries in microbiology research, while incorporating examples of current research that connect to his themes. He also introduces a refreshing feeling of wonder—a feeling that is often ignored in books on similar topics—by highlighting the beauty of these microbial-animal interactions. “I wanted to get people to appreciate how interesting microbes are, rather than viewing them as sources of disease or dirt, to actually realize that they are important parts of the world around us. We should embrace that they are the dominant form of life on the planet, with profound influences on the way life works,” said Yong. I Contain Multitudes is sure to instill that appreciation and wonder in readers, encouraging them to think about the dimensions that microbes add to our lives.